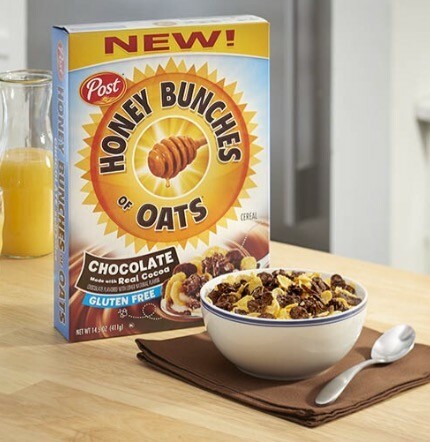 Post has just introduced Honey Bunches of Oats Chocolate, joining the growing number of mainstream cereals labeled gluten free. The cereal is made with oats that are mechanically processed, a growing trend in the gluten-free cereal market prompted by Food and Drug Administration rules. FDA labeling rules allow the use of oats as long as the finished food contains less than 20 parts per million of gluten, the standard applied to any gluten-free product. This new cereal is the first gluten-free variety within the Honey Bunches of Oats family. According to a Post representative, the company purchases oats from a grower who carefully monitors the growing, harvesting and processing of the oats to prevent gluten cross-contamination. The oats are certified through NSF International’s gluten-free certification program. 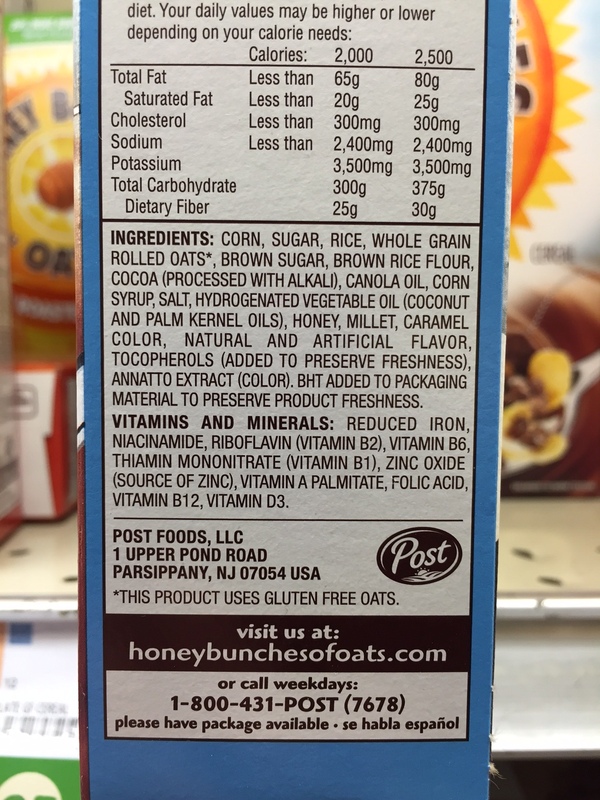 Post has implemented rigorous testing processes and quality assurances to ensure that the cereal is gluten free and meets FDA labeling requirements, the company says. Although the cereal is not made in a dedicated facility, all ingredients, ingredient suppliers and production lines are evaluated to assure there is no risk of cross contamination, according to Post. Every lot of the cereal is sampled and held until test results come in. “If any sample contains 10 ppm or more of gluten, we do not release that production lot for sale,” the Post representative said. cocoa granola clusters mixed with honey covered flakes. In addition to rolled oats, the cereal is made with grains such as corn, rice and millet. Though oats are naturally gluten free, most oats in North America are grown alongside gluten-containing grains rather than being harvested and produced in a wholly gluten-free environment. As a result they are highly likely to be cross-contaminated. Prior to approval of the FDA’s labeling laws, only specialty gluten-free oats grown and processed in a precise way to prevent cross-contamination were permitted in foods labeled gluten free. Due to the scarcity and higher cost of these specialty gluten-free oats, food manufacturers making gluten-free products are utilizing mechanical and optical sorting processes to separate stray wheat and barley from the oats prior to manufacturing. This includes General Mills’ Cheerios and Quaker’s gluten-free oatmeal. U.S. cereal makers have been broadening their reach to gluten-free consumers in recent years. Post also makes gluten-free Fruity and Cocoa Pebbles. In addition to Cheerios, General Mills produces Lucky Charms and several varieties of Chex that are labeled gluten free. Only the Honey Bunches of Oats Chocolate flavor is gluten free. 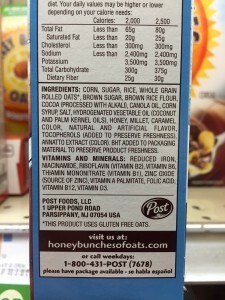 Post also makes Honey Bunches of Oats Granola Protein Chocolate, which contains wheat and is not gluten free.